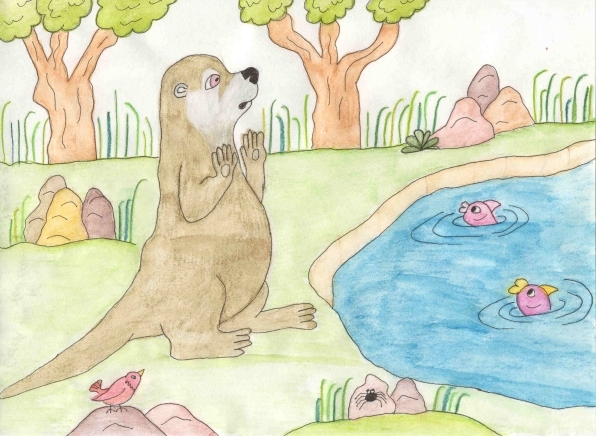 Rupert, the furry brown otter, threw his ball high into the air and ran to catch it. He was having so much fun trying to throw it higher than the treetops. One time he threw the blue ball so high that he couldn’t see it and when it fell to the ground, he didn’t know where it landed. "Where’s my blue ball?" He scratched his head. "Hmm, I wonder where it went?" He looked in the tall green grass, parting it with his paws. "It’s not here." He looked behind a pile of dirty brown rocks. "It’s not here either." Just then a bird landed on one of the rocks. "Red bird, have you seen my blue ball?" "TWEET! TWEET! TWEET! No, I haven’t seen it," the bird replied. "Did you look behind those bright yellow daffodils and orange tulips?" "Not yet. I’ll go and do that right now," Rupert said. He ran over to the flowers and pushed them to the side. "My ball’s not here either. I wonder where it went?" He was down on his hands and knees, crawling around in the leaves when he spotted a spider sitting on a stone. "Black spider, have you seen my blue ball?" The spider wriggled its body back and forth. "No, I’ve not seen your blue ball. Have you looked under the rose bush over there?" Rupert looked at the roses. "No, I didn’t look there yet. I’ll go and do that right now." He ran over to the rose bush. It was covered with fragrant pink flowers. Rupert tried to crawl under it. "Ouch! Ouch! Ouch! This rose bush has sharp thorns!" He pulled the thorns out of his fur and sat on the ground. "My blue ball isn’t under the bush. I wonder where it is?" He stood up, brushed the dirt from his fur and walked down to the pond. There were fish swimming about in it. "Fish, have you seen my blue ball?" he asked. Two fish came out of the water, blowing bubbles. "We’ve not seen your blue ball. It didn’t land in the water. If it had, we’d have heard it splash. Did you look in the pile of leaves at the bottom of the oak tree?" "No, I didn’t look there. I’ll go and do that right now," Rupert said and ran to the pile of leaves. He lifted some of them up and tossed them into the air. They fluttered down to the ground. "My blue ball isn’t here either. I wonder where it is?" He stood, rubbing his chin, and looked up into the tree. "There it is! There’s my blue ball. It’s stuck between two branches of the tree." Otters can’t climb trees, so Rupert didn’t know how he could get his blue ball. It was too high for him to reach. "I have an idea." He ran back to the rocks. "Red bird, would you fly up to the branches of the oak tree and knock my blue ball down? It’s stuck." "TWEET! TWEET! TWEET! I’ll do that for you," the red bird answered. She flapped her wings and flew into the branches of the oak tree. It was hard for Rupert to see her because of all the green leaves. "Are you ready to catch it?" she called down. Rupert opened his arms. "I’m ready." The red bird pecked the ball with her beak and knocked it out of the branches. It came tumbling down into Rupert’s arms. "Caught it! I’m glad to have my blue ball back." "TWEET! TWEET! TWEET! From now on, don’t throw your ball so high or you’ll lose it again," the red bird cautioned. Rupert ran down to the pile of stones and showed the black spider that he’d found his blue ball. He ran to the pond and showed the fish that he’d found it too, and then he spent the rest of the day throwing it into the air and catching it. He didn’t throw it quite so high ever again.